These two parks which share the famous waterfalls on the border of Argentina and Brazil were separately listed in 1984 and 1987. Since then, the park agencies of the two countries have held a seminar to coordinate their management efforts in protecting the site. This includes harmonization of the two management plans, joint planning of tourism developments, and cooperation in law enforcement, research and monitoring. This action is to be commended as the falls and the surrounding forest area are truly one integrated unit and such transfrontier cooperation between State Parties is to be encouraged. The Administración de Parques Nacionales de la Argentina has also recently opened a new Centre for Subtropical Research in Iguazu. 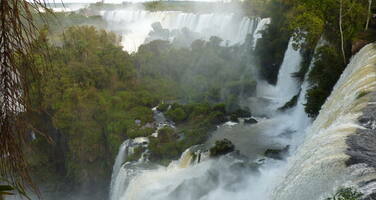 The Bureau may wish to act on the anomaly of having this site listed twice on the World Heritage list and to suggest to the State Parties that, in future, it could be given the name "Iguazu/Iguaçu National Parks, Argentina/Brazil."